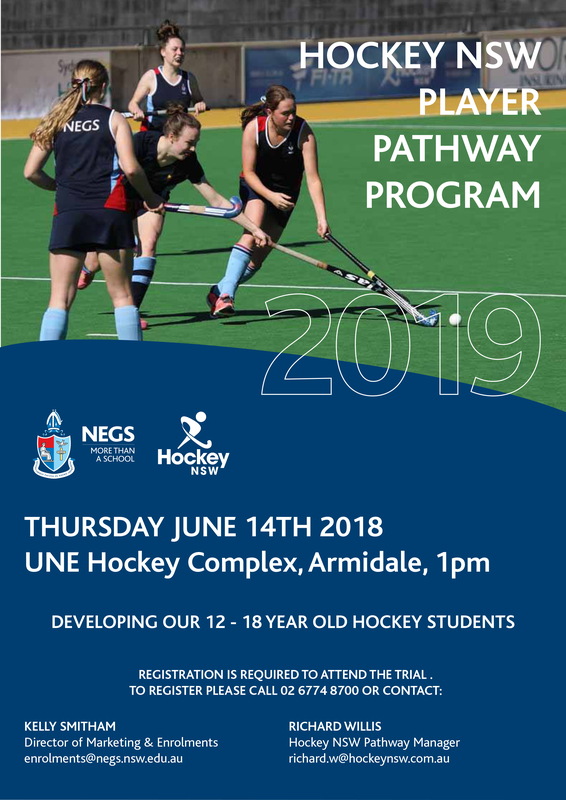 NEGS has today announced a formal partnership with Hockey NSW, with the launch of an official Player Pathway Program incorporating high performance coaching delivered exclusively to NEGS students. This will be the first of its kind outside of major metropolitan high schools. In addition, NEGS has announced they will commence building a state-of-the-art synthetic hockey field to be ready in early 2019. Built to Federation of International Hockey (FIH) Standards, this world-class facility will be the envy of many hockey associations around Australia due to innovative design elements that include LED lighting (one of the first of its kind in Australia) and cutting-edge hybrid synthetic surface. The program will be managed by Richard Willis, Hockey NSW Player Pathway Manager and delivered by Greg Doolan, Regional Coaching Coordinator for Hockey NSW. Hockey NSW aim to commence trials later in the year. David Thompson, CEO of Hockey NSW has welcomed the news that NEGS will be investing in an international-standard hockey facility and says it will be a boost for the sport and the community. Blair Chalmers, Participation Manager says, “Hockey NSW is keen to increase female participation in the sport, and with 70% of their registrations located in regional NSW, NEGS are ideally positioned to capture this market. Hockey NSW is committed to lifting the profile of hockey, and a key part of the program is identifying and assisting talented athletes reach their potential. We have seen great success with similar programs running in other state sports high schools resulting in a significant increase in program numbers both from existing students and new participants”. Students from years 7 to 12 will be eligible to attend the trials, both from NEGS, around Australia and internationally. Those successful in making it into the year-round hockey program will receive intensive training and skills development delivered to them as current and newly enrolled NEGS students. Principal, Mrs Mary Anne Evans says the school’s alliance with Hockey NSW marks the achievement of a key milestone in line with NEGS’ Strategic Plan. “Our partnership with Hockey NSW represents NEGS’s commitment to growing and diversifying as we recognise that extra-curricular activities play an integral role in the NEGS experience. The Armidale community will also benefit as our newly installed hockey field will be available for external training, sporting camps and hockey games. I look forward to seeing NEGS and Hockey NSW deliver even more success for our school, our hockey players and the New England region”.